I have some problems with my plugins. I tried to organize them in folders and some of them don't even display in Photoshop anymore. As the Plugin Commander error message explained, some plugins can only have a category/submenu name that is not longer than the old one. So you need to choose a new category name that is shorter. Your "Commercial_unused" and "Commercial_used" names are quite long, so you will not be able to move some plugins into them. Concerning your problem that some plugins do not appear in Photoshop anymore, I am not sure what could be the problem, because I do not know what you have done. Maybe you disabled them with the Enable/Disable feature of Plugin Commander. Thanks for your prompt answer, Harald. 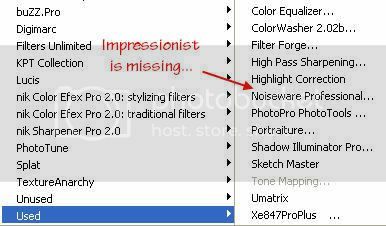 My "Impressionist" plugin is missing from my folder despite the fact that is enabled. Impressionist is quite old, so maybe your version of Photoshop does not support it anymore. If you already made it work previously and it does not appear anymore after you changed its category in Plugin Commander, please delete the changed version of the Impressionist .8bf file and copy a backuped version in its place, but do not change its category. Does it appear in Photoshop again? Maybe Impressionist does not work anymore after you changed its category. I never heard it about a plugin, but who knows. You could also send me a copy of the Impressionist plugin, so that I can check it out. It's OK, I fixed the problem by reinstalling Impressionist. So you know, Impressionist works with every single Photoshop version provided you're on Windows. It doens't work with Mac.